Dark Chocolate Almond Dipped Pretzels have only 3 ingredients and are an easy snack recipe, done in under 20 minutes! You know you need one last minute snack for your gathering tomorrow, right? 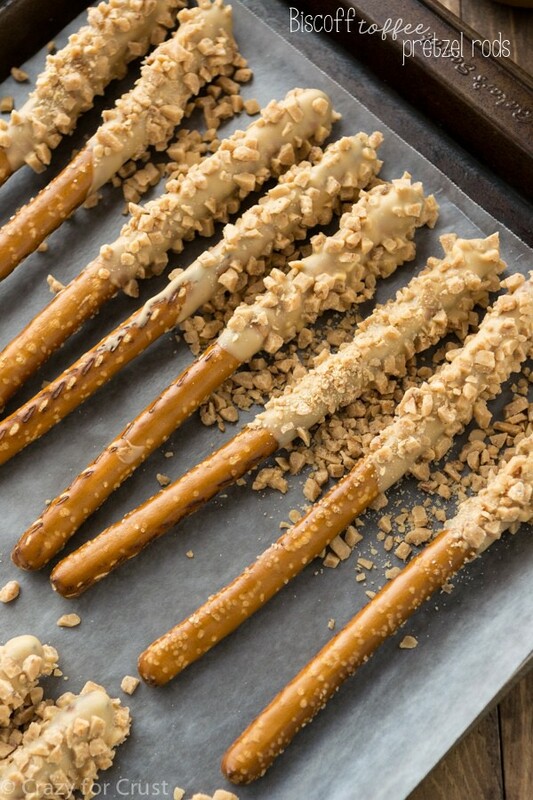 Dipped pretzels make great gifts for the holidays, too! What are you all doing for the holiday? I’m hosting, so right now I’m running around trying to clean, cook, and not go too crazy with the menu. 5 people = 5 side dishes = 5 pies, right? I always say I don’t care where I spend Thanksgiving (and really, I don’t), but I know Mel is secretly happy we’re staying home. At home he can have football on all day and no one can interfere with his enjoyment of all the games. I mean, if I’m talking too loud or Jordan’s putting on a dance show…he can just sneak upstairs to the TV. An hour later we’ll be all wondering where he’s gone. I’m just hoping his fantasy team does good. Around here, we root for the fantasy team over any other! Do you watch football on Thanksgiving? Or, like, at all? Football, for me, is about the food. If you’re looking for a great party snack, may I suggest dipped pretzels? I dipped these in dark chocolate and coated them with Blue Diamond Smokehouse Almonds. <–Good choice, if I do say so myself. Not only would these chocolate dipped pretzels be great for a party, but they double as foolproof homemade gifts. They only have 3 ingredients and the take less than 10 minutes of active time. Melt, dip sprinkle, chill. Really, that’s it. If you’re not familiar with dipping truffles and such, be sure to watch my video for tips. But here’s a great tip I learned recently: when you’re melting chocolate, use a Dixie paper bowl. They’re microwave safe and it’s such easy clean up! I learned this quite by accident during our kitchen remodel and I swore I’d never melt chocolate in anything but disposable bowls again. I also love how the chocolate almond dipped pretzels kind of look like bats. You know, for football parties. 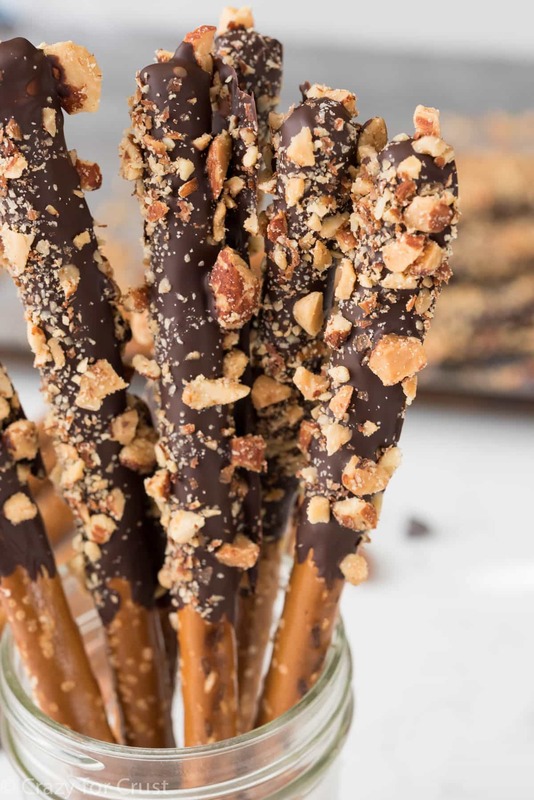 These Dark Chocolate Almond Dipped Pretzels are so easy to make! This recipe has only 3 ingredients and is perfect for snacking, parties, or gifts! Line a cookie sheet with wax paper. Place chopped almonds in a bowl and get out your pretzel rods. Stir chocolate chips and oil in a microwave safe bowl. (I like to use Dixie paper bowls for this because it’s easy clean up.) Heat on high power in 30 second increments, stirring between each, until chocolate is melted and smooth. Dip each pretzel rod in the chocolate as for as you can in the bowl you’re using. If you want the chocolate to come further up the rod than the bowl allows, use as spoon to paint it up the rod. Tap off the excess chocolate, then place the rod on the prepared cookie sheet. Sprinkle with chopped almonds. Repeat until chocolate is gone. Chill to set. Store in an airtight container for up to 1 week. These make great party snacks or homemade gifts! 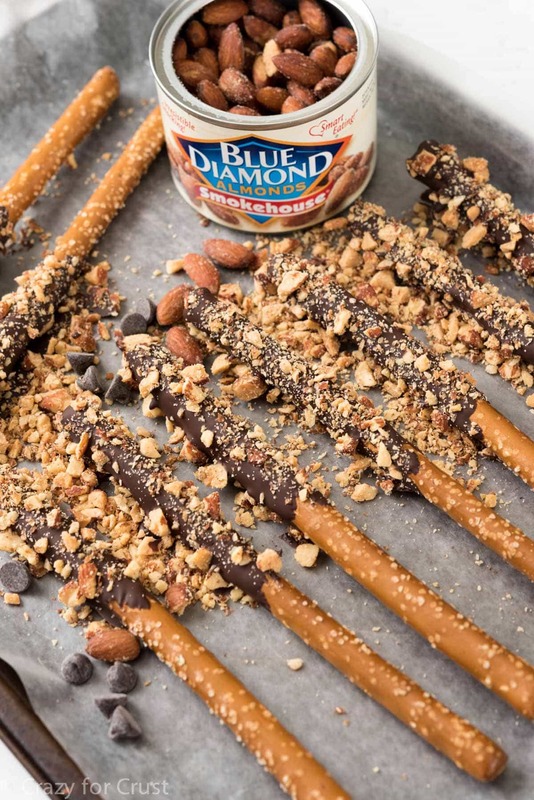 This post is sponsored by Blue Diamond Almonds. Ditch the chips and grab some Game Changing Flavors this football season! Enter for a chance to win the Ultimate Football Party Prize Pack, get great savings and ideas for delicious snack hacks at GameChangingFlavors.com. All opinions are 100% my own. Thank you for supporting the brands that make Crazy for Crust possible. Sweet and salty is the best kind of snack. These look amazing, I love pretzels with chocolate and nuts so these are perfect. And football is definitely all about the food, it’s the most important part! We don’t watch a lot of football here, but when we do the snacks are important! A yummy finger food-snack-dessert! With all of the time consuming food preparation, it good to have a quick and easy recipe too. These pretzels would make great holiday gifts as well! This is the kind of stuff you make for others to give as gifts, but you end up eating all by yourself! LOVE. Sweet, salty, chocolate, crunchy…GAH! 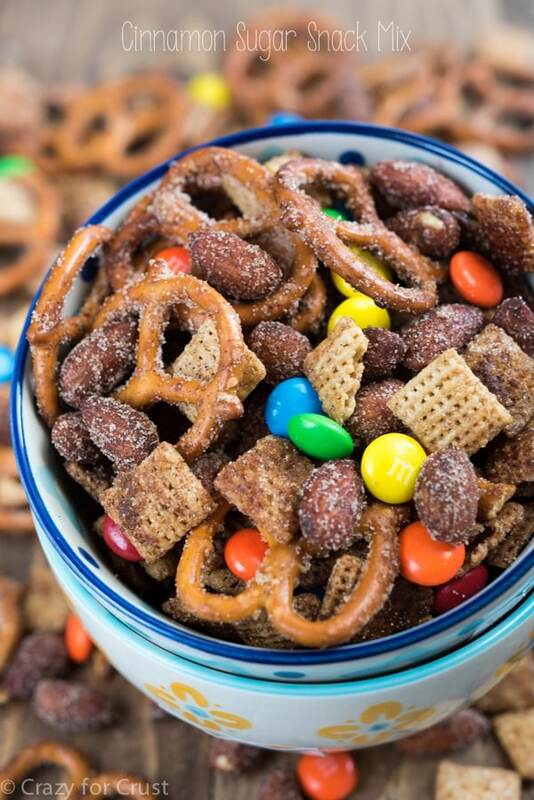 These pretzels seriously have all of my loves in one perfect little bite! Is it wrong that I want to devour these for breakfast? Pinned! Well, I mean, pretzels are healthy, right?? Thanks Taylor! I need to make these for my daughter’s lunches! Pucks, bahahaha! This is the kind of game day snack I like! Salty/sweet combos win every time!